How does iSense®. Touch Free Intelligent Faucet operation differ from a standard mechanical faucet? iSense® gives you a complete touch free experience to use the faucet including turning on-off water flow, adjusting water temperature, saving your favorite water setting, and using the presets without touching any part of the faucet. 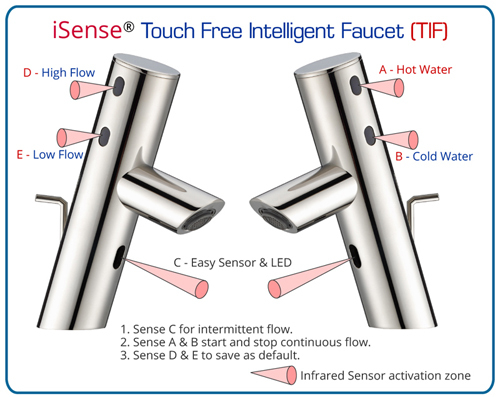 What kind of technology does the iSense® use to activate Touch free intelligent faucet? The faucet is based on Infrared technology that senses objects within activation zone. There are five sensors on the faucet to perform 13 functions for complete touch free operation. How are the sensors arranged in the iSense® technology? There are five sensors in all the Cinaton iSense® 5 Sensor Touch free faucets to perform 13 functions. The arrangement of the five sensors are shown in the following drawing. How do I turn the faucet on/off? 1. Place your hand or an object up to 9 inches in front of the center Easy Sensor (Sensor C) activation zone. Water will turn off when your hand or an object is away from the activation zone. 2. Place your hand over both two sensors (Sensor A and B) on the right side of the faucet. Water will continue to run until you turn it off by placing your hand over the two sensors (Sensor A and B) again. Is it safe to have the digital controller underneath my kitchen sink? Yes, it is safe to have the digital controller installed underneath the kitchen sink. It is similar to your garbage disposer and dishwasher lines. The controller only use 6 volt DC power supply. How do I change water temperature? When water is flowing, place your finger about one and half inches in front of Sensor A (on upper right side.) This will increase water temperature. Place your finger about one and half inches in front of Sensor B (on lower right side.) This will lower water temperature. How do I adjust water flow? You can control water flow or amount of water by placing your finger about one and half inches in front of Sensor D (on upper left side.) This will increase water flow. Place your finger in front of Sensor E (on lower left side.) This will lower water flow. All kitchen faucets will come with a maximum flow rate of 2.2 gpm and 1.5 gpm for lavatory faucets. How do I increase my water pressure? 1. Check and clean your filters(strainers) in the spray head and pull-down hose. 2. Clean the strainer in water supply hose adapters of Digital Controller. The green, yellow, and red color LED lights in the front of faucet indicates the different function and status of the faucet operation. It will also flash to indicate battery voltage low when faucet is not in use. Please refer to your User Manual. How do I disable front Easy Sensor (Sensor C) for working in the sink area? Simply hold your finger in front of Sensor A for 5 second to pause the Easy Sensor (Sensor C) when water is not flowing. The Easy Sensor will not be activated while working in the sink area. To re-enable the Easy Sensor, go through the same process by holding your finger in front of Sensor A for 5 second to re-activate the Easy Sensor (Sensor C). Are there any safety features if I forgot to sense off the water flow? The iSense® features a 5-minute safety shutoff feature to ensure water will not run continuously if accidently left unattended. When using the Easy Sensor (Sensor C), the faucet shuts off when your hands or an object leaves the sensing zone. Why does my faucet turn on unintentionally? The faucet might be turned on if you or an object enters the activation zone of Sensor C or when you are reaching for an item behind your sink. What is the spout's range of motion? The spout can rotate 150 degrees. The faucet is available in Chrome and Stainless Satin Nickel finish. Call 1-855-348-8080 or visit www.cinaton.com. Please note that consumers can register their product at this website. Can the Touch free Intelligent Faucet be installed outdoors? It is not recommended to install the faucet outdoors. The Touch free Intelligent Faucet uses "infrared sensor" technology to sense objects such as fingers, hands or objects. Infrared light is emitted from an LED inside a sensor. An object in the path of the infrared light will reflect back to the sensor and be received by an infrared receiver to activate the faucet function. The strong infrared light in the outdoor sunlight will interfere with the sensor and cause the faucet to malfunction. Can I install a Touch free Intelligent Faucet on a sink against a kitchen window with direct sunlight? Yes. Our inventive technology will not cause problems to the infrared sensor faucet. But in some cases, a shiny sink wall or surface might reflect sunlight at the sensor and activate the sensors, especially the Easy Sensor (Sensor C). Also, if you wear light color clothing or shiny material, it might activate the sensors. You can turn the spout away from the current position or remove the reflecting object to eliminate this problem. Can the Touch free Intelligent Faucet be installed on any type of sink? Cinaton's faucets are designed for all types of deck mount applications. It is recommended when installing vessel type sinks, the center Easy Sensor(Sensor C) of faucet must be elevated above the edge of sink to prevent infrared sensor from being blocked. Do I need an electrician or a plumber for installation assistance? The faucet kit includes an User Manual with both operation and installation manual for easy installation. So there is no need to hire an outside professional to assist you. Normally you can install it by yourself using the instructions provided. When is it necessary to change the backup batteries? When the red LED light flashes, it is the indication to change your backup batteries. The batteries are only for power outage backup. Brand name AA alkaline quality battery is recommended. does iSense® Touch free Intelligent Faucets connect to the power? iSense® Touch-free Intelligent Faucets requires an electrical outlet (a 120~240 volt AC adapter included) to connect to the control box. 4 backup AA batteries are included with the faucet kit. Will the Digital Controller fit under my standard sink cabinet? Yes. The Digital Controller dimension is only 5.82" width X 8.1" height X 2.45" depth and weight 1.5 pound. No soldering is required. The supply hoses nozzles and all the hose connections are 1/2" or 3/8" standard thread for easy installation. How long does it take to install this faucet? We estimate less than one hour, but the timing may vary based on your level of experience. Use water, and dry with a soft cloth. Avoid any abrasive cleaner or abrasive sponges. How do I clean the strainer at the cold/hot water supply hose adapter? Turn off the water supply valves, disconnect the cold and hot water supply hose adapter, and remove the strainer inside the 1/2 inch adapters. Rinse debris from the screen, then reinstall. Your flow should improve. 5 year limited warranty on faucet, finish, and electronics (other than batteries) from the date of the original consumer purchase under normal residential use. Can the Digital Controller be replaced? Yes. The module design of Digital Controller can be replaced available from Cinaton Inc.